The stories of many of CPS workers are told on the website civilianpublicservice.org, a site created in 2011 by Mennonite Central Committee for the 70thanniversary of the opening of the first CPS camp in 1941. The civilianpublicservice.org website is a treasure trove of information about a generation that is almost gone. For example, there is a “Find a CPSer” feature, where you can search a database of 11,932 workers by name, birth year, denomination, or original hometown and state. 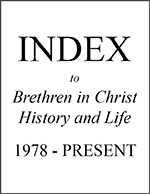 I searched the denomination field for “Brethren in Christ”; in most cases, the men whose names I recognized on that list are no longer living. This is not true of the five men whose stories we published in the December 2017 edition of the journal, and who had registered as conscientious objectors (1-W) during the Vietnam War in the 1960s and did alternative service at a hospital in New Hampshire. One of the CPS workers whose name appears in the “Find a CPSer” database and is still living is Morris Sherk, who entered Civilian Public Service on January 5, 1945. Morris, now 92, is a retired teacher who volunteers regularly in the Brethren in Christ Historical Library and Archives at Messiah College. A native of Mount Joy, Lancaster County, Pennsylvania, he is the author of In the World but Not of the World: Rapho District (1872-1957), published in 2009 by the Historical Society. He has also written his autobiography, including a section about his 21 months in CPS, which he has offered for publication in this edition of the journal. In the second article, Luke Embree, a recent graduate of Asbury Theological Seminary who is now planting a Brethren in Christ Church in Lexington, Kentucky, uses the stories of three men named Christian to describe three different ways Anabaptist Christians responded to Pietism in Lancaster County, Pennsylvania during the late seventeenth and early eighteenth century. His article, while not a comprehensive analysis of the impact of Pietism in Lancaster County or the lives and ministry of these three Christians, it is an interesting glimpse into some of the thinking of the time, including those who were part of the River Brethren, now the Brethren in Christ. The third feature is a regular one in the April edition each year. In November 2017, the Sider Institute for Anabaptist, Pietist, and Wesleyan Studies sponsored its annual study conference on “Prophetic Mission: Being the Church in a Post-Church Age.” This edition includes the three major presentations from the conference, along with written versions of a panel discussion. The Sider Institute has already announced that the 2018 conference will continue the discussion with the theme, “Prophetic Witness: Being Brethren in Christ in a Post Church Age.” That conference will be held on November 8-9, 2018—mark your calendars now to attend (or wait for the papers in the April 2019 journal!). Books being reviewed this time include a book of poetry written by a Quaker poet; a biography of prominent Mennonite professor C. Henry Smith (he was among the first Mennonites to receive a Ph. D. and taught at both Goshen College and what is now Bluffton University); the most recent book by Bruxy Cavey, teaching pastor of The Meetinghouse, Be In Christ Canada’s largest congregation; and a book about contextualizing the gospel reviewed by a Brethren in Christ pastor who is himself engaged in doing just that.